The trial involving 17 journalists and executives of Turkish newspaper Cumhuriyet will start on Monday 24 July at 9:00am in Istanbul’s Çağlayan Justice Palace. The trial is expected to continue until Thursday 28 July. The International and European Federation of Journalists (IFJ and EFJ) join their affiliates TGS and DISK Basin-Is in condemning the trial which is based on unfounded accusations that the paper is secretly supporting the PKK – a militant Kurdish organisation and FETO, the group allegedly responsible for last year’s failed coup. EFJ president Mogens Blicher Bjerregård will be present at the trial on behalf of both IFJ and EFJ to monitor the proceedings and express solidarity with the accused. 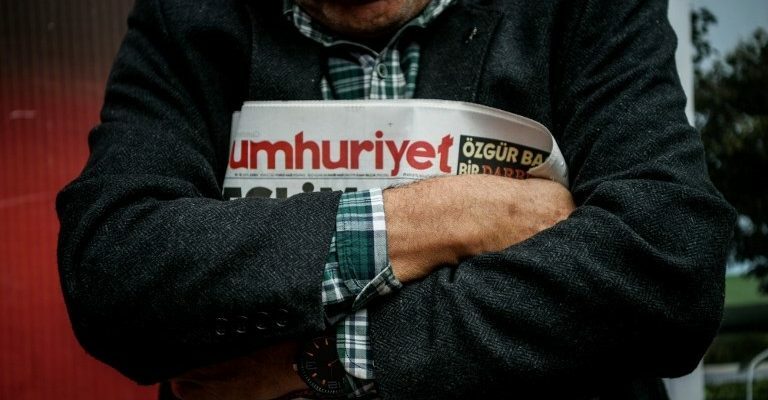 The Cumhuriyet employees on trial are editor-in-chief Murat Sabuncu, columnist Kadri Gürsel, CEO Akin Atalay, printing administrator Önder Çelik, attorney Bülent Utku, cartoonist Musa Kart, columnist Hakan Karasinir, attorney Mustafa Kemal Güngör, reporter Ahmet Şık, editor Turhan Günay, columnist Güray Öz, columnist Hikmet Aslan Çetinkaya, former editor-in-chief Can Dündar, columnist Aydin Engin, financial manager Bülent Yener, accounting manager Günseli Özaltay and columnist Orhan Erinç. They are charged with “helping an armed terrorist organisation while not being a member” and “employment-related abuse of trust”. The government maintains that since 2013, the newspaper has acted as “defender and protector” of FETO and the PKK. This is despite Cumhuriyet’s long history of criticism towards these groups. These charges carry up to 43 year sentences. The 17 employees have also effectively been punished without conviction, having already spent months in pre-trial detention. The charges are based solely on journalists’ tweets and news reports, rather than any concrete evidence which has led press freedom supportive organisations to regard the prosecution as politically motivated. Since president Erdogan’s election to the presidency in 2014, the country has experienced a rapid descent towards authoritarianism, most noticeably after April’s constitutional referendum which among other amendments abolished the post of prime minister and replaced the parliamentary system with a presidential one, granting the executive much wider ranging powers. Last year’s failed coup saw president Erdogan and his ruling Justice and Democratic Party (AKP) begin a nationwide crackdown on dissent, including the dismissal of over 100,000 civil servants, the forced closure of hundreds of media outlets and civil society groups and the jailing of 164 journalists. Turkey is now the world’s leading jailor of journalists. Picture credit: Ozan Kose / AFP.